NYC, 02/06/2019, 11:30AM. A Dog's Purpose (2017): The journey of a dog. 100 min. Director: Lasse Hallström. Starring Josh Gad, Dennis Quaid, Peggy Lipton. 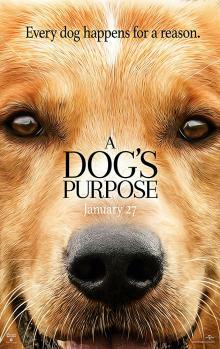 A Dog's Purpose has grossed $64.5 million in the United States and Canada and $139.5 million in other territories for a worldwide gross of $204 million, against a production budget of $22 million. On June 21, 2017, CEO of Amblin Entertainment Michael Wright announced that a sequel was in development. On August 26, 2018, Universal began production on the sequel, which will be directed by Gail Mancuso, and scheduled for release on May 17, 2019.